The Fifth, Sixth and Seventh Doctors, together for the first time! Gallifrey is in a state of crisis, facing destruction at the hands of an overwhelming enemy. 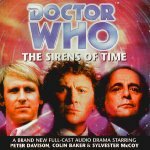 The Doctor is involved in three different incarnations - each caught up in a deadly adventure, scattered across time and space. The web of time is threatened - and someone wants the Doctor dead. The three incarnations of the Doctor must join together to set time back on track - but in doing so, will they unleash a still greater threat?